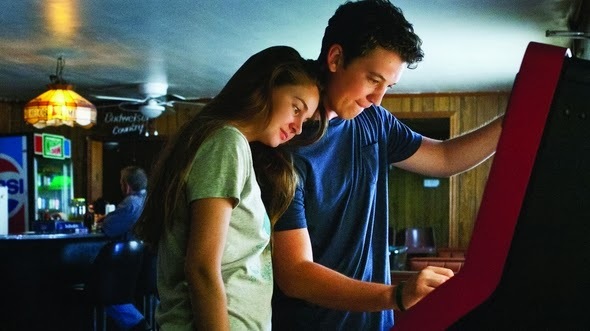 Director James Ponsoldt's THE SPECTACULAR NOW starts with such verve and pace and authentic humour that it feels almost like a great John Hughes teen comedy. In fact, the lead actor, Miles Teller (RABBIT HOLE), seems to be channelling a young John Cusack with his portrayal of charming, fun-loving but troubled teen Sutter - a kid who thinks he's the life of the party but is really just a nascent alcoholic who's letting his issues with his absent father cloud his relationship with his well-meaning but distant mother (Jennifer Jason Leigh) and his sweet new girlfriend Aimee (Shaileene Woodley - THE DESCENDANTS). The first half of the film stays firmly in that John Hughes vein, despite the growing unease about the amount of drinking Sutter does, and how in dating Sutter, Aimee starts sipping from a hipflask too. But we're still just in the mode of looking at a meet-cute, an odd-couple dating story, with wryly observed tales of still being drawn to your ex-girlfriend, and Prom. But then something happens about half-way through the film that totally undoes its balance. The lovely Aimee persuades Sutter to find his father, and casting Kyle Chandler against type, we can a lovable selfish drunk, who makes Sutter so self-loathing that he puts Aimee and himself in danger. I won't say more for fear of spoiling the film, but it really bothered me that there were no consequences - whether emotional or external - to these events. Worse than that, it broke that feeling of integrity and authenticity to the movie, and I was progressively less and less engaged with how it all worked out. I'm not sure whether that sharp right turn into nonsense is the fault of the original author, Tim Tharp, or the screenwriters Scott Neustadter and Michael H Weber (500 DAYS OF SUMMER). Either way, it's a real shame because it undercuts the great work done in the movie's first half. THE SPECTACULAR NOW played Sundance, where it received the Special Jury Prize for Acting, SXSW and London 2013. It opened in the USA and Canada earlier this year and will be released in Australia on December 5th.